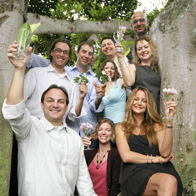 South Florida Green Drinks Board: (from top left clockwise) Doug Pacht, David Etzler, Lindsay Calkins, Clint Malson, Yalmaz Siddiqui, Brooke Ahrens, Marci Zaroff, Rachel Fulton, Mike Wallander. BOCA RATON, FL (October 15, 2010)–Caruso Ristorante , 4th Generation Market, Table 42 Italian Kitchen & Wine Bar, Jake’s Stone Crab and Rustic Cellar are joining together to roll out the green carpet for the inaugural Deliciously Green VIP “After Party” at Royal Palm Place on Saturday, November 6, 2010 at 6:30 p.m. Held in conjunction with the Wyland Living Green Fair taking root in Downtown Boca that weekend and sponsored by Royal Palm Place and www.livingfla.com, the “After Party” event will benefit two “green-conscious” nonprofits: South Florida Green Drinks (http://www.southfloridagreendrinks.org/) and Wyland Foundation (http://www.wylandfoundation.org/). Deliciously Green VIP “After Party” guests start the night off by meeting at the Gazebo to check in. They will then be guided via green directional arrows through Royal Palm Place to the participating restaurants where they will sample green food selections, wines and specialty drinks. Following their last stop, guests will have the opportunity to continue their culinary experience by choosing to dine at one of the participating restaurants offering an exclusive value dinner special solely available to Deliciously Green VIP After Party guests. South Florida Green Drinks’ mission is to build an engaged South Florida green community of individuals and business owners through networking, online outreach, and special events. The nonprofit Wyland Foundation, founded by renowned environmental artist Wyland, has helped children and families around the nation to rediscover the importance of healthy oceans and waterways through public art programs, classroom science education, and live events. The After Party occurs immediately at the close of the first day of the Wyland Living Green Fair that runs from 10 a.m. to 6 p.m. at Mizner Park that includes a Green Market at Royal Palm on Saturday, from 8 a.m. to 1 p.m. Done in an entertaining way, activities at the Wyland Living Green Fair will engage fairgoers of all ages through an array of interactive experiences that include Wyland painting 50-foot murals with South Florida children (a new one each day); product showcases; unique exhibitions; stage performances; organic cooking demos by South Florida chefs and food tastings; displays of eco-friendly hybrid cars; previews of organic fashions; a Kids Eco-zone; the Wyland Clean Water Mobile Learning Center complete with a 40-person theater, a running river, video microscopes, a watershed exhibit with actual rainfall; Wyland’s Extreme Water Journey Maze; movies; live entertainment; concert performances by Disney Channel and Radio Disney teen stars, and a host of other activities. Wyland — who was hailed a “Marine Michelangelo” by USA Today and is a leading international advocate for marine resource conservation — is lending his name and commitment to this year’s fair as the City of Boca Raton that serves as host to the fair, lends the green space in Downtown Boca. A portion of proceeds benefit the Wyland Foundation (http://www.wylandfoundation.org/). Advance tickets can be purchased for $15 online at http://www.livingfla.com/ and $20 at the event. For continuous news updates on the Wyland Living Green Fair, visit http://www.livinggreenfair.com/, follow the fair on twitter/green_fair, friend the fair on Facebook, email inquiries to info@livinggreenfair.com or call 561-241-7309. The mission of South Florida Green Drinks is to build an engaged South Florida green community of individuals and business owners through networking, online outreach, and special events. A lively mixture of people from NGOs, academia, government and business, the nonprofit offers great ways in which to network, collaborate and make good things happen, both professionally and for the environment. Every month South Florida professionals from a range of backgrounds that share a common interest in the environment meet up for a drink at informal sessions known as Green Drinks. The events are simple and unstructured, but many have found employment, made friends, developed new ideas, made business deals, and more.